Our Brazilian virgin hair is 100% natural and chemical free. We inspect each bundle to guarantee they are unprocessed and pure. The loose deep weave is a great virgin hair wig style for black women. 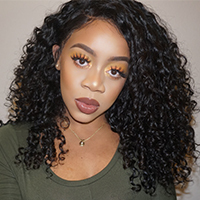 We guarantee they are 100% raw virgin hair so that these extensions can be washed, cut, straightened, curled, dyed, you can create any comfortable style as you desire.